For information on how you can help, please attend one of our meetings, or e-mail us for more information 4×4@scvsar.org. The 4×4 Team meets at Taylor’s Landing on the 1st Tuesday of each month at 7:00 PM. 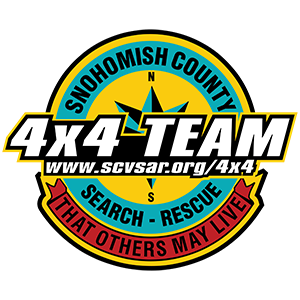 Membership in a Snohomish County Volunteer Search & Rescue Unit is voluntary. New members must be at least 14 years old. Members aged 14 – 17 must be accompanied in the field by a parent or guardian who is also an qualified SCVSAR member unless they are in ESAR. Underage members In ESAR may participate in field unaccompanied by a parent or guardian. You must not have been convicted of a felony. A background check is mandatory. The first step in joining is to attend a unit meeting of the open unit closest to your home. There are 7 units in Snohomish County Alderwood, Everett Mountain Rescue, Explorers, Marysville, Operations Support, Sheriff’s Office & Snohomish. The units are generally organized by area where members live. Emergency Worker Registration Card(DEM Application) for the Washington Department of Emergency Management. 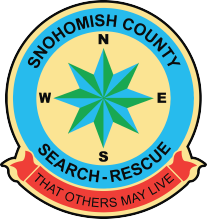 Snohomish County Volunteer Search & Rescue Personnel Release, Hold Harmless, Indemnification Agreement and Warranty. A legible photocopy of a Washington state Drivers License, and the license from which the photocopy was made. A condition of membership is a favorable background check performed by the Snohomish County Sheriff Department. You will need a picture for your Identification Card. The picture should be a digital “passport type”, (Head & shoulders, no hats or dark glasses) and emailed to your unit coordinator is preferred. To be eligible for assignment with a team in the field, New Members need to complete an equipment check with an SCVSAR Unit team leader, demonstrating that you have at least the minimum Essential equipment as described by the individual unit requirements. As you gain SAR experience, you may need more specialized gear for technical missions, some of which is also listed below. All members need to maintain a current First Aid card & CPR card. You can take these classes through Search & Rescue (when scheduled), or through a local fire station, Red Cross, or possibly through your employer. New members will be trained by their unit and county along side seasoned members in various specialties such as search techniques, rope rescue, medical, tracking, equipment handling, radio procedures, etc. Upcoming training events are listed on the SCVSAR Training Calendar . Some advanced training such as Swiftwater Rescue Technician, Helicopter Rescue, and rescue vehicle driving are restricted to active members who have one or more years and meet additional requirements. NOTE: You must be assigned a DEM Number before you can attend any trainings (or missions). New members will not be placed in positions that are above their skill level, which may jeopardize themselves or others on missions. Volunteers commit time, energy & backcountry expertise to helping others in our community whenever and wherever needed. Missing or injured hikers/climbers, river rescue, walk-aways (children or elderly), evidence search, remote aircraft or vehicle accidents, and more. Terrain includes city, forest, rivers, rock, snow/ice all of Snohomish County.